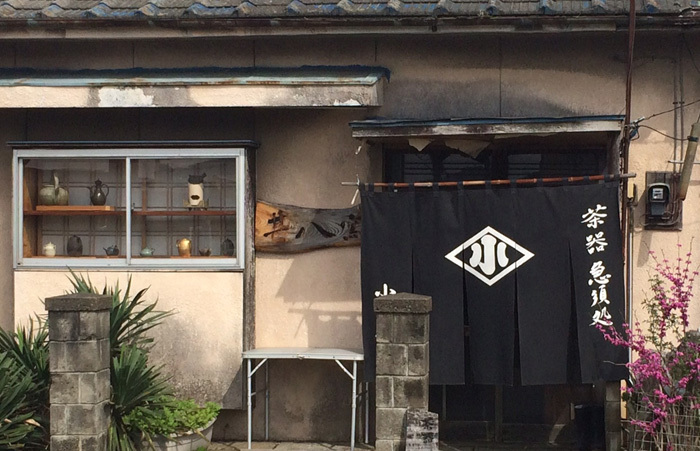 Ogawa Jinpachi is a craftsman based in Kasama city, Ibaraki prefecture. 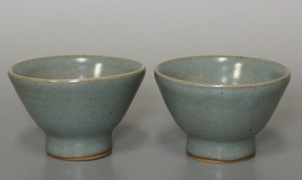 The city is well known for pottery but Jinpachi does not classify his work as Kasama ware. 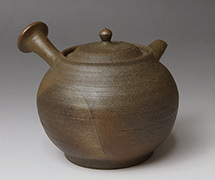 He says that although he lives in Kasama,his works do not adhere to a particular style. 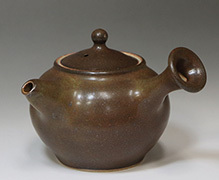 Jinpachi 's work has become popular amongst ceramic connoisseurs and he is now considered one of the foremost teapot craftsmen in Japan. 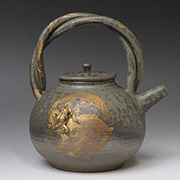 We at Artistic Nippon consider ourselves fortunate to be able to offer a selection of his works for sale to our valued customers. 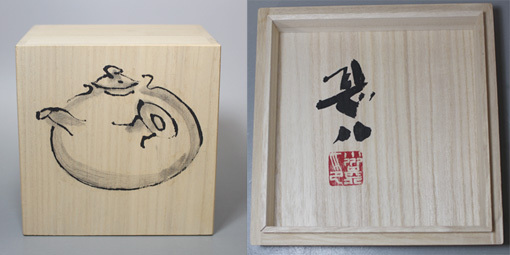 All his teapots are one-offs and come in an original signed wooden box. 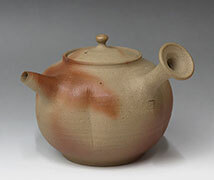 His teapots need to be held to be appreciated properly but we hope that you will be able to gain some idea of their value through reading the article and looking at the the photographic images shown on this page. 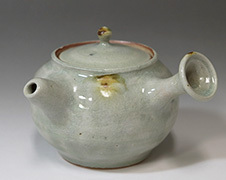 The teapots are fired in an electric kiln. Visiting Jinpachi’s workshop for the first time was an overwhelming experience. A consummate craftsman, he likes to connect with his clients, dealing directly with the buyer. I was immediately engaged in a lengthy discussion about culture and quizzed about my opinions. Taken aback, I was unable to give coherent answers but learned through Jinpachi san’s observations on a number of themes that he is an observant and intuitive artist who has devoted his life to discovering the essence of his craft. 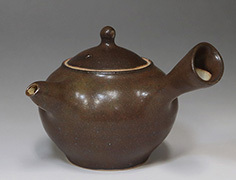 He believes that a teapot only becomes worthy of the name when it is used to make good tea, and always has this thought in the back of his mind during the crafting process. He says that 90% of the secret of making good tea lies in the water. 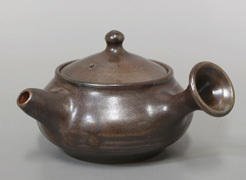 The other 10% is divided between the type of tea leaves used, the brewer’s technique and the quality of the teapot. It is within this tiny margin that he applies his efforts, confronting the issues involved with a philosopher’s zeal and an artist’s focus. 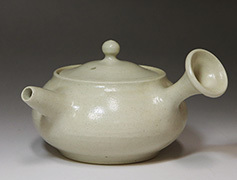 His ultimate aim is achieve a perfect balance between the different parts of the teapot in order to produce the best tasting tea. 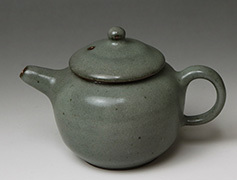 I tried pouring with a number of his teapots and each time I was struck by the quality of the "pour". 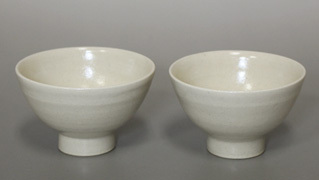 I also noticed a certain difference in touch between Jinpachi's pieces and Tokoname ware. 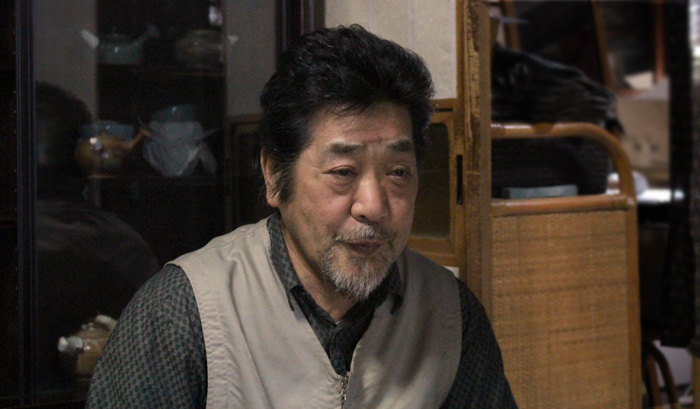 Ogawa Jinpachi was born in Kizarazu city, Chiba prefecture in 1949. 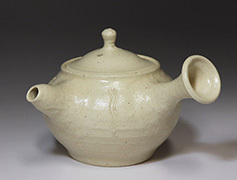 He became fascinated by Japanese ceramics after visiting Kasama as a young man and in 1975 he set up his own kiln in the city. 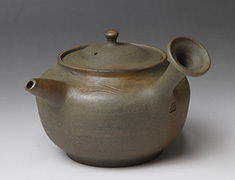 One of his teapots was selected by the world famous restaurant Noma for use at its special restaurant event at the Mandarin Oriental Hotel, Tokyo in 2015. Kasama city is situated about 100km north east of Tokyo. 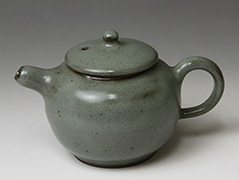 Ceramic ware has been produced here since the late 18th century and it is currently home to a large number of independent potters. Kasama Inari Shrine is one of the three largest of its kind in Japan. It is popular with worshippers from all over the country, especially at New Year and during the various seasonal events held within its precincts. The city boasts a large number of galleries and workshops as well as a modern museum park.